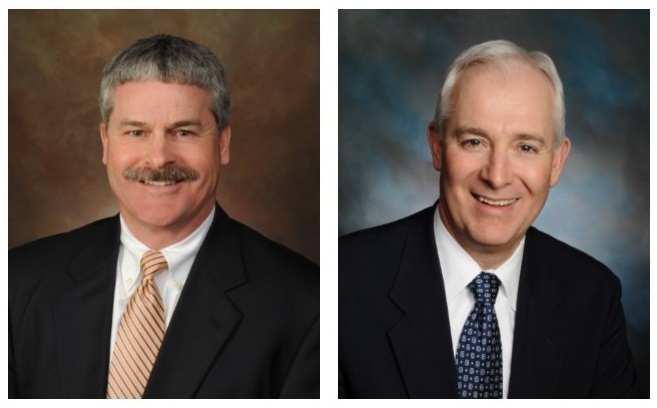 As Pentucket Bank enters its 125th year in 2016, its Board of Trustees has elected Scott Cote as Chairman of the Board and he remains as Chief Executive Officer and Chuck Walker has been promoted to President in addition to his current role as Chief Credit Officer. “As Pentucket Bank looks forward to its 125th year, we will continue our dedication to our customers, to the communities we serve, and to our employees.” Scott Cote stated. With over 43 years of experience, Scott has an extensive background in administration, commercial and consumer lending, branch operations, marketing, strategic planning, finance and community support. Scott joined the Bank in 1998, was appointed President in 2008 and named Chief Executive Officer in 2010. Scott Cote assumes the role of Chairman, most recently held by Kendall Smith. Ken will continue to serve on the Bank’s Board of Trustees. Established in 1891, Pentucket Bank is a mutually-owned community bank with assets of $650 million and branches in Haverhill and North Andover, Massachusetts and Salem and Hampstead, New Hampshire. Pentucket Bank has been recognized by Forbes Magazine as one of three New England based community banks that are making a difference, by Banking New England Magazine as a bank that is committed to revitalizing the communities that it serves, and is a five time recipient of The Boston Globe’s Top Places to Work. Pentucket Bank is the leading bank in Haverhill, one of the fastest growing banks in New Hampshire and North Andover, and a Top Lender recognized by the Small Business Administration.